It has been well established that life, and in particular microbial life, evolved to occupy all ecological niches, ranging from the icy waste lands of the arctic to the vastness of the deep sea with its crushing pressures as well as hot springs with water temperatures near or above boiling point. Organisms that thrive under these extreme conditions are generally known as extremophiles. They have developed ways to thrive and grow under circumstances that are lethal for most life on earth such as high and low pH (alkaliphiles and acidophiles), high salinity (halophiles) and high pressure (piezophiles). The most studied external factor concerning growth is temperature and organisms are classified accordingly as thermophile (growth temperature between 41 and 122 oC), mesophile (able to grow between 20 and 45 oC) or psychrophiles (growing between -20 and +10 oC). With regards to temperature, it is interesting to note that more than 80% of the Earth’s biosphere has a permanent temperature below 5 oC because the vast majority of the Earth is covered by oceans and to a lesser extent by permafrost and polar regions (1,2,3). Hence, psychrophiles are the most abundant extremophiles in the biosphere and they include representatives from all domains of life. Blood Falls (figure 1) is an example of a place previously thought to be devoid of all life. The falls pour from the Taylor Glacier in the McMurdo Dry Valleys of East Antarctica and are named after its distinct red-brown color, which is caused by iron oxides that precipitate from the iron-loaded saltwater flowing from the glacier upon contact with oxygen (4). Interestingly, the Taylor Glacier is the coldest one on Earth with a mean temperature of -17 oC (4) but despite this sub-zero temperature, Blood Falls houses a thriving bacterial community primarily made up of different psychrophilic marine bacteria (5). This, in turn, raises the question what special adaptations allow these bacteria to grow under these harsh conditions. Cold-adapted organisms display in general a variety of adjustments at the cellular and molecular level (1,2,3). These include, most importantly, the use of specialized enzymes able to sustain metabolism and cell cycle at low temperatures through maintenance of a high catalytic rate (1,2,3). Here, I will discuss the different structural features cold-adapted enzymes have evolved to ensure low temperature activity. Temperature is a well-known variable that controls the rate of chemical reactions. By elevating the temperature the rate increases exponentially, while, conversely, lowering the temperature decreases the rate exponentially. Cold-adapted enzymes are therefore faced with the challenge of maintaining high catalytic rates at low temperatures. This is accomplished by the use of specialized enzymes equipped with a catalytic rate that is not affected by temperature, resulting in an up to ten-fold higher catalytic rate at low temperatures (1,2). Biochemical characterization of psychrophilic enzymes revealed a higher Km when compared to related enzymes from mesophilic organisms. Hence, substrates are not able to bind as well in psychrophilic enzymes. This poor substrate affinity reduces the activation energy and lowers the temperature dependency of the enzyme’s catalytic rate, enabling catalysis in cold environments (1,2). The ability to function efficiently at cold temperatures comes with a prize, namely: psychrophilic enzymes are poorly thermostable when compared to related enzymes from mesophilic and thermophilic organisms. In particular, the active site region seems to be the most heat-labile part of these enzymes (1,2). The instability and high activity of psychrophilic enzymes at low temperatures points to a flexible structure. High resolution crystal structures have been invaluable in understanding the special features of these enzymes which enable them to perform catalysis at low temperatures. 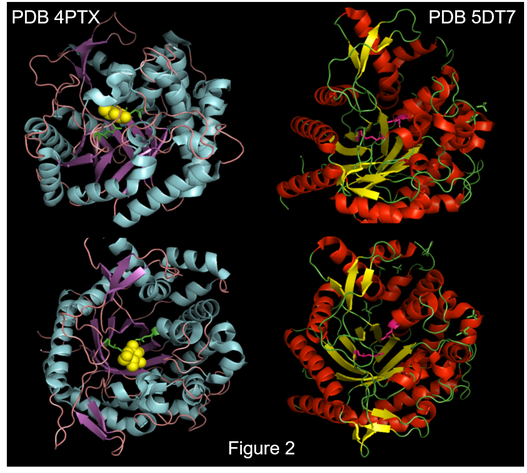 Comparison of structures from psychrophilic enzymes with the structures of related thermostable enzymes showed that the catalytic residues are conserved, suggesting that features that contribute to flexibility are located in other parts of the enzyme. Indeed, interactions that contribute to overall protein stability are weakened or reduced in psychrophilic enzymes. The available structural data shows that this can be achieved as follows: (i) increase in glycine residues, which contribute to greater flexibility, (ii) decrease of proline residues in loop regions, reducing conformational rigidity, (iii) reduction in arginine residues lowering salt bridges and hydrogen bonds and (iv) use of small apolar residues in the active site region to create weaker hydrophobic interactions (1,2). Cellulases are group of enzymes comprising endoglucanases, cellobiohydrolases and β-glucosidases that act in concert to facilitate the breakdown of cellulose. Specifically, the first two enzymes depolymerize cellulose into cellobiose, short oligosaccharides and glucose. While β-glucosidases catalyze the hydrolysis of the glycosidic bonds in cellobiose and short oligosaccharides, thereby releasing glucose (6). 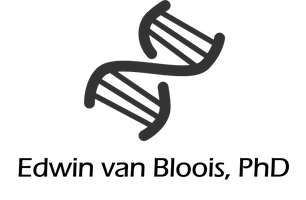 β-glucosidases are conserved throughout all kingdoms of life, including noncellulolytic organisms such as humans. These enzymes play a crucial role in different biological processes. For example, in plants this enzyme is involved in defense against pathogens, cell wall metabolism and lignification. In microbes, β-glucosidases are involved in carbon recycling and cellulose degradation, while in humans these enzymes are required for the metabolism of xenobiotics. Moreover, a defect in human β-glucosidase causes Gaucher’s disease. Based on their sequence and hydrophobicity, these enzymes belong either to the GH1 or GH3 family. GH1 family members are found in archaea, plants and animals as extracellular or cell-bound enzymes, while GH3 members are prominent inside the cells of bacteria, fungi and yeast (6). Exiguobacterium antarcticum B7, isolated from a lake at Antarctica, has been identified as a Gram-positive, psychrophilic bacterium. Recently, the high resolution structure of a GH1 β-glucosidase from this cold-adapted bacterium was determined at a resolution of 2.85 and 2.24 Å, respectively (7). 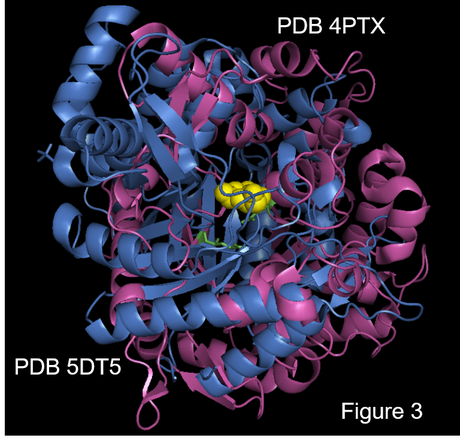 This structure (PDB 5DT7) is shown in figure 2 as well as the structure of a related GH1 β-glucosidase (4PTX) from Halothermothrix orenii, a thermophilic bacterium (8). This structure was solved at a resolution of 1.8 Å and contains beta-D-glucose (shown as yellow spheres). For clarity only one protomer of each enzyme is depicted. As expected, the catalytic residues are strictly conserved. In E. antarcticum β-glucosidase these are Glu162 (acid/base) and Glu350 (nucleophile). Both residues are shown as magenta sticks in the psychrophilic enzyme, while the catalytic residues of H. orenii β-glucosidase are shown as green sticks. Importantly, the structure of E. antarcticum β-glucosidase was solved in a tetrameric arrangement (figure 4) with two pairs of active sites at opposite ends of the oligomer. The tetramer is stabilized through hydrophobic and electrostatic interactions between different surface loops as well as loops near the active site (7). To obtain more insight into the biological relevance of the tetramer, its activity was compared with the activity of the monomer. This showed that the monomer is about ten-fold less active, demonstrating that oligomerization is crucial for its biological activity. Moreover, the available structural evidence suggests that, although tetramerization is in general rare amongst GH1 family members, it is more prominent in enzymes from hyperthermophilic archaea. This indicates that tetramerization is a strategy employed to adapt β-glucosidases either to high or low temperatures. 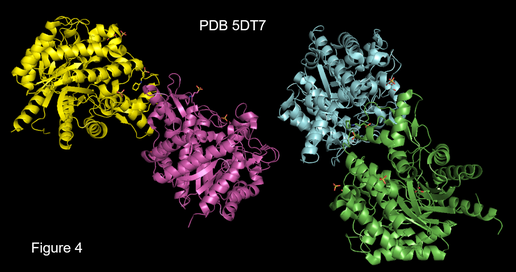 The latter is supported by molecular dynamics simulations that suggest that tetramerization increases the flexibility of the enzyme (7), an established hallmark of psychrophilic enzymes (1,2). Microbes that thrive at subzero temperatures have evolved different ways to overcome the thermodynamic barrier of a severely decreased reaction rate at low temperatures. The most important strategy at the molecular level concerns the development of cold-active enzymes that enable catalysis at low temperatures through an increase in enzyme flexibility. This reduces the enzyme’s affinity for its substrate, which, in turn, reduces the activation energy and thereby decreases the temperature dependency. Most psychrophilic enzymes are highly active at low temperatures and heat labile. Combined, these unique properties result in three advantages of key importance in biotechnology: (i) less enzyme is required at lower temperatures because of their increased activity, (ii) psychrophilic enzymes typically display a good performance under mild process operations, thereby preventing costly heating and (iii) these enzymes can be efficiently and selectively inactivated due to their heat liability (2). Not surprisingly, cold-active enzymes are used in different applications. For example, Lipase A and B from Candida antarctica are two established psychrophilic enzymes of which the latter is available through Novozymes and used in different applications, including the synthesis of pharmaceuticals (2). The ongoing identification of psychrophilic microbes demonstrated that these organisms are a rich source of potentially useful biocatalysts. It is therefore expected that characterization of these enzymes will greatly expand the catalytic toolkit. 1. Struvay C, Feller G. 2012. Optimization to low temperature activity in psychrophilic enzymes. Int J Mol Sci. 13: 11643-11665. 2. Siddiqui KS, Cavicchioli R.2006. Cold-adapted enzymes. Annu Rev Biochem. 75: 403-433. 3. Aqvist J, Isaksen, GV, Brandsdal BO. 2017. Computation of enzyme cold adaptation. Nat Rev Chem. DOI: 10.1038/s41570-017-0051. 4. Badgeley JA, Pettit EC, Carr CG, Tulaczyk S, Mikucki JA, Lyons WB. 2017. 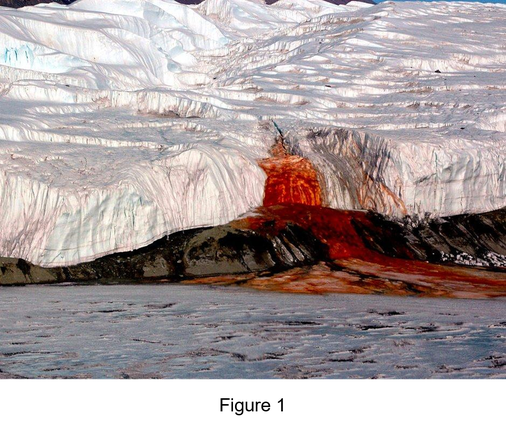 An englacial hydrologic system of brine within a cold glacier: Blood Falls, McMurdo Dry Valleys, Antarctica. J Glaciol. 239: 387-400. 5. Mikucki JA, Priscu JC. 2007. Bacterial diversity associated with Blood Falls, a subglacial outflow from the Taylor Glacier, Antarctica. Appl Environ Microbiol. 73: 4029-4039. 6. Ahmed A, Nasim FH, Batool K, Bibi A. 2017. Microbial β-Glucosidase: Sources, Production and Applications. J Appl Environ Microbiol. 5: 31-46. 7. Zanphorlin LM, de Giuseppe PO, Honorato RV, Tonoli CC, Fattori J, Crespim E, de Oliveira PS, Ruller R, Murakami MT. 2016. Oligomerization as a strategy for cold adaptation: Structure and dynamics of the GH1 β-glucosidase from Exiguobacterium antarcticum B7. Sci Rep. 6:23776. doi: 10.1038/srep23776. 8. Hassan N, Nguyen TH, Intanon M, Kori LD, Patel BK, Haltrich D, Divne C, Tan TC. 2015. Biochemical and structural characterization of a thermostable β-glucosidase from Halothermothrix orenii for galacto-oligosaccharide synthesis. Appl Microbiol Biotechnol. 99: 1731-1744.